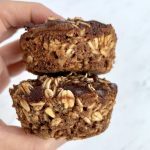 These oatmeal cups are filled with rich chocolate flavor and make the perfect breakfast on the go or snack. Spray a 12 cup muffin tin with cooking spray. Set aside. In a bowl add the oats, salt, baking powder, and chia seeds. Set aside. In another bowl, whisk 2 eggs. Add 1 cup milk and 1/3 cup honey and mix together. Sift the cocoa over the egg mixture and whisk well. Add the dry oat mix to the liquid mix and combine all together. Scoop the mixture into the muffin tin. Sprinkle chocolate chips on top of each oat cup. Store in airtight container for up to 5 days or in the fridge or freeze for up to 3 months. To eat, heat up in the microwave for a few seconds or enjoy as is! Muffin cups may dry up over time. You can add a couple teaspoons of milk before heating it for added moisture.